I don’t play many other games outside the COD realm but I do enjoy a little Battlefield sometimes when I am in the mood. 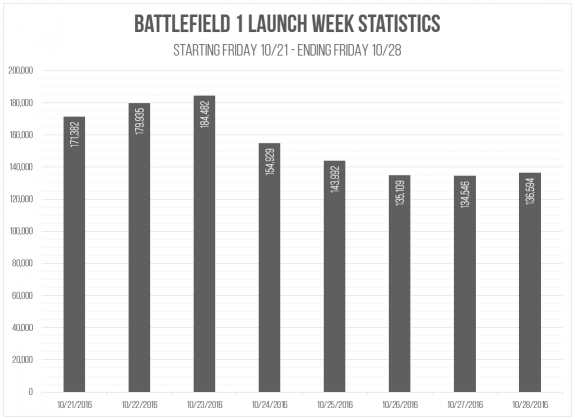 Battlefield 1 just launched two weeks ago and since I have some interest in this release of Battlefield I thought it would be good to check out the launch player counts for it since I have seen a lot of positivity about this release. I know comparing Battlefield and Call of Duty is kind of like comparing apples and oranges with the smaller arcade type map design focused in current COD titles but it is good to put the numbers in comparison because these are yearly (or almost yearly on the Battlefield side) releases from AAA publishers that spend a lot of freaking money on these games. Unfortunately I wasn’t interested enough in Battlefield 4 or Battlefield Hardline launches to get peak player counts for those titles but for Battlefield 1 – I would say it was a pretty strong launch for the PC hitting a peak on the third day of almost 185,000 players. The closest Call of Duty can come to this is the first Black Ops hitting almost 119,000 on it’s sixth day of release. 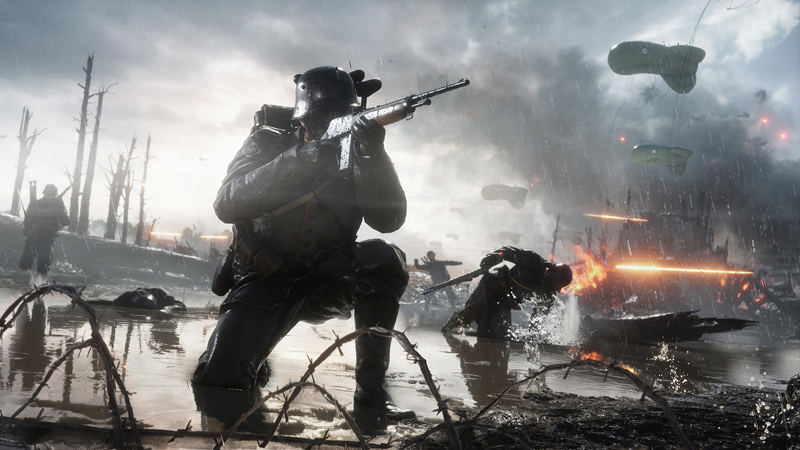 We are now two weeks into Battlefield 1 release and it is still holding around 110,000 players peak along with two other major games releases – Titanfall 2 and Infinite Warfare/MW Remastered. Although I have kind of been “off the Battlefield” for a while in terms of playing a Battlefield game I liked what I saw a few weeks ago leading up to the Battlefield 1 release. I got a few nights of game time in during the open BETA and although it took quite a bit of adjustment for me to get into it – I enjoyed what I played for the most part. In the past I always seem to get into Battlefield games during the Infinity Ward COD releases – Bad Company 2 instead of Modern Warfare 2, Battlefield 3 instead of Modern Warfare 3 and even now it seems that kind of holds true for this Infinite Warfare release as well. Black Ops 2 kept me interested enough to keep playing instead of Battlefield 4 and I just didn’t see Battlefield Hardline going anywhere so I passed on that. I haven’t really put a lot of time into a Battlefield game since Battlefield 3 (and that was only 199 hours) but I did just pick up Battlefield 4 with all the DLC recently during a good Origin deal as well. I was going to hold off on picking up Battlefield 1 for a little while but my interest in any part of this years COD release was kind of low so I went ahead and picked it up a few days after release. I only have about 12 hours of gameplay in at this point but I will say I am enjoying it so far. It’s very nice to get back to some more basic weaponry on large scale maps since COD has strayed so much from those things over these last years but it is definitely an adjustment. I tend to stick to Rush more than Conquest but I have to say that I am enjoying Conquest a little more in Battlefield 1 than previous titles. I’ve always been a run and gunner (usually with more deaths than kills) but focus pretty hard on objectives. Battlefield isn’t COD – but sometimes I still try to play it like it is and I struggle adjusting at times – usually wind up staring at the spawn screen more than playing it seems! However I’ve been enjoying the game so far and would recommend it if you are a fan of the Battlefield games at all – especially to get back into the World War era games. I will be looking at the Infinite Warfare / Modern Warfare Remastered launch numbers next week but as it looks right now the first day numbers are down lower than Modern Warfare 2 from 2009 – which was the first Steam Exclusive COD title that can be tracked in this manner.